Paint All Furniture The Same Color – You can take old, mismatched furniture, ugly craigslist pieces and paint them all the same color or complimentary colors in order create an impression of there being a matching set. You can paint the desk, bed frame, dresser, nightstand, mirror, etc. This will make a HUGE difference for very little money. Spray Paint Accessories – Spray paint lamps, plastic bins, garbage cans, and any other little accessories in the room that are looking old and haggard. This is a lot cheaper than replacing some of these items just to have the new look. I spray painted my daughters standing lamp in her room, from a cheap looking white to a silver and it now is a cute addition to her room. It was headed for Goodwill right before I sprayed it. Paint Stripes on The Wall – One thing you can do, without taking on a whole wall painting project is just to do one thick stripe that goes around the middle of the walls of the room. All you need to do is mask off the section you want to paint and then take your roller and do it. 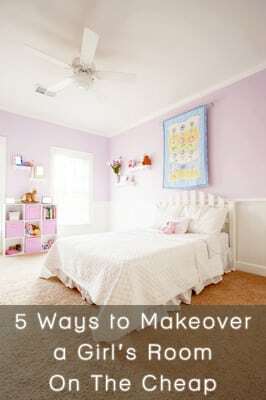 This is a fast, cheap way to really create a facelift for the whole room. Cheap Rug + Stencils + Paint – Go to a cheap store and buy the cheapest, most plain white or cream rug you can find, then place a stencil over it and using fabric paint, create a pattern over the rug or do a design in the center of the rug that ties the whole design together. Paint Hardware – Don’t forget you can paint hardware such as doorknobs, handles on furniture, closet doors handles, knobs, etc. Don’t waste money on the extra cost of replacing knobs and handles in the room and just remove them, spray paint and replace them. It’s so easy if you spray them all at once.